Experience that can’t be taught in a classroom. If you’re a hard-working, career-minded student looking for a bright future, a paid internship or co-op program opportunity with Sentry Insurance might be the right fit for you. Sentry’s student-specific programs provide you with practical experience in real-world, real-work situations. From internship opportunities in actuarial, claims, human resources, marketing and more, to our industry-leading information technology co-op program in Madison, Wisconsin, Sentry offers driven students the chance to gain experience that can’t be taught in a classroom—experience that will prove to be invaluable no matter where your future takes you. We invite you to explore the internship and co-op program opportunities that await you at Sentry. If you’re a hard-working, career-minded student looking for a bright future, an internship with Sentry Insurance might be the right fit for you. Sentry’s paid internships provide students with practical experience in real-world, real-work situations. Get insider information on all our internship program offers straight from actual interns. Check out our Intern Insights! Real world. Real work. No fluff. 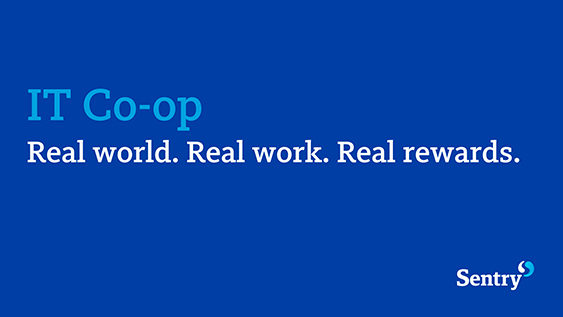 Our IT co-op program is a sought-after experience. If you’re a dedicated information technology student, consider joining our co-op team. Our brand new Stevens Point IT Co-op Program offers UWSP students a cutting-edge opportunity to gain real-world, real-work experience as part of our Application Development team.